Health advice and precautions for visitors to South Africa including preparations before travel, pecautions and health care. While there are risks anywhere you travel, South Africa has a relatively salubrious climate and our levels of hygiene, health care, and water treatment make it a pretty safe destination. There are however, a few points to note and preparations to make before you travel. It is recommended that you have the required inoculations four to six weeks before you travel to South Africa. A yellow fever inoculation certificate only becomes valid 10 days after inoculation - after which it remains valid for 10 years. Facilities in cities and larger towns are world-class, offering specialist services by highly skilled professionals. Doctors are well trained and must be registered with the Health Professions Council of South Africa. You will find that in rural areas the clinics and hospitals deal with primary health needs, and may not offer the range of medical care that the large metropolitan hospitals do. Trained medical caregivers are deployed round the country, so help is never far away. Provincially run emergency services are supplemented by a privately operated services, which attend to roadside and other emergencies, transporting patients in well- equipped ambulances and emergency vehicles to appropriate hospitals. Pharmacies are well stocked, and equivalents to most international medicines are available. Pharmacists may not dispense Schedule 3 drugs and up without a prescription, so visitors on chronic medication should carry their own prescription. South Africa has a warm sunny climate and pollution and ozone layer damage has led to extremely high UVA and UVB penetration over South Africa. Protecting yourself against the harsh sun with sunscreen, a wide-brimmed hat, and sunglasses is essential - especially between 10am and 4pm, and regardless of whether there is cloud cover or not. You can still get sunburned even if you have a dark complexion - especially if you are from a cooler climate and have not had much exposure to the sun. Use the highest possible UV protection It is the UVA rays (that don’t cause burning) that you are trying to block out. Ideally you should aim for an SPF of 30 or more to offer protection. High quality tap (faucet) water is available in South Africa's urban areas, but not all water in rural areas is safe to drink straight from the tap. In some areas, the water is mineral rich, and you may experience a bit of gastric distress for a day or two until you get used to it. Bottled mineral water, both sparkling and still, is readily available in most places. Drinking water straight from rivers and streams could put you at risk of waterborne diseases, especially downstream of human settlements. The water in mountain streams, however, is usually pure and wonderful. In the Cape, particularly, the water contains humic acid, which stains it the colour of diluted Coca Cola; this is absolutely harmless, and the water is wonderful. You may also find this colouring in tap water in some areas. Many of the main tourist areas are malaria free, so you need not worry at all. 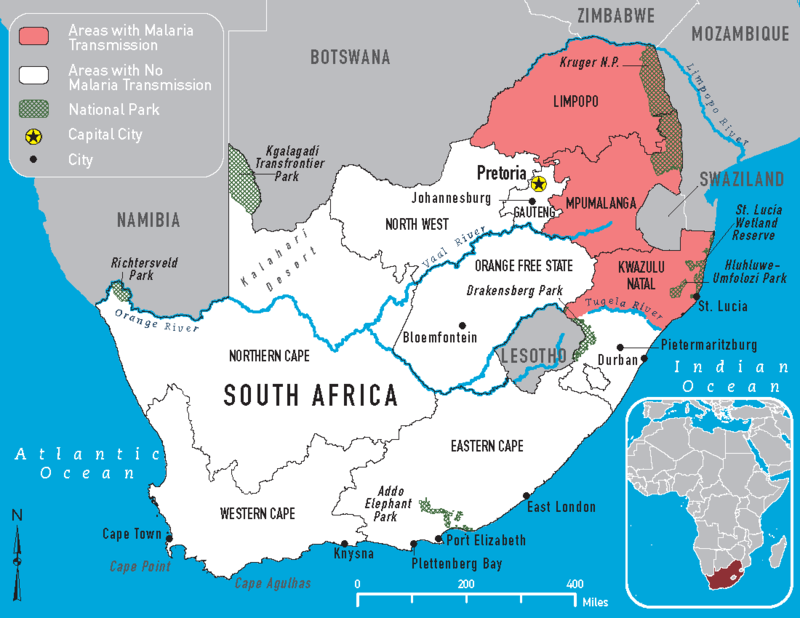 However, the Kruger National Park, the Lowveld of Mpumalanga and Limpopo, and the northern part of KwaZulu-Natal do pose a malaria risk in the summer months. (Transmission is seasonal, with peak rates of infection occurring in April and declining by June). Whether you take oral prophylaxis or not, avoid being outside at night as far as possible as the anopheles mosquito, which carries malaria, operates almost exclusively after dark. Always use mosquito repellent, wear light-coloured long pants, long-sleeved shirts and closed shoes at night, and sleep under a mosquito net in endemic areas. Also use an insect repellent and electronic vaporising mats or burning insecticide coils are also helpful.